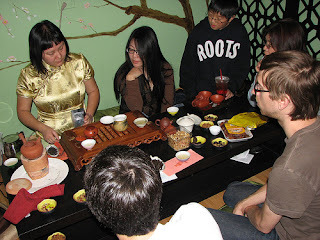 Last Sunday night, Jason invited the local LATA group to have tea at his new place. During the 4 to 5 hours of drinking, a few of us brought our own tea and brewed with a different water had different results compare to brewing at home. We jokingly suggested from now on, we all bring our own water to future tasting events. What we had experienced further stretch the importance of water, its impact on tea flavor. 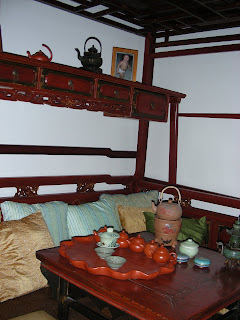 A classic novel of China "Dreams of the red chamber" had a chapter about tea activities in the compound, describing the extend of water which was used to make tea. 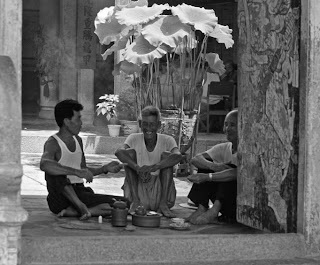 A group of young girls (cousins), Bao Yu (a teenage boy) and Miao Yu - a young 17 years old nun having tea at a temple. After Miao Yu made tea for every one, she explained the water was a collection of snow flakes landed on blooming Prune flower petals from the first snow fall in January, stored in a sealed clay jar buried under ground for 3 years. Whether this is true or not, improve our tea or not, the poetic notion makes my tea taste better already. Other one I heard is taking over night condensations on lotus leaves in early mornings to make tea, which has cooling property in addition to improving taste. One of the joys I get out of having a tea shop, probably the most enjoyable out of all is to spread Chinese tea culture. By saying this, of course not forcing everyone comes through the door to learn what I feel so special and endearing. However when some one truly is inquisitive about the world of tea, it really gets me excited. One of the girls who work here is very much into tea and the whole Chinese tea culture after exposing to it for the last few months. It's quite a sight to watch a blonde girl pouring tea and explaining it to customers with enthusiasm. Her friends also got into tea influenced by her. After a lesson on brewing techniques and taste training, the first thing after school on a Friday afternoon is to drink kung fu tea at my platform. It started with 3 then 4 then 8 then 12 boys and girls showing up on Friday afternoons, Saturdays, some times even Sundays whenever they get a chance, spending 3 to 5 hours at a time, going through 3 or more teas, buying and sharing the most high end teas. It's rather amazing, not quite as I expected before I opened the shop, but definite a good thing for these kids, it's a better and healthier addiction than drug! PV, as most kids here say, "I just want to grow up to be a normal person", without knowing they will never be normal, living here is realistically not the norm of this society. 1/2 of the kids smoke and take drugs, mainly because they have too much spending money. Their parents are hard working business people whom have very little time to spend with their kids, materials are substitutions of love and time. My friend Ming (a PV mom) said to me "how are they going to live without good tea from now on or live anywhere else with no access of good tea? You spoil them!". I then said to her, I am glad I'll have access to good tea even if I don't run a tea shop later in my life. Despite what's available on the market, I know where to get my good stocks of tea, how fortunate is that! Members of the LA Tea Affair (LATA)had ordered custom made Yixing pots with help from Marshaln, Action Jackson and friend of Marshaln. They finally arrived last week. Each and every pot are made with same clay, style (shui ping hu) and size with our own choice of chop marks at the bottom of the pot. 3 of the 4 pots I have are marked with my tea shop name in Chinese for obvious reasons. The 4th is marked as "double happiness", a few other members also have the same chops. 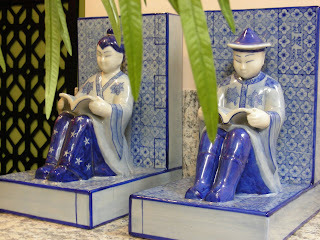 Double happiness is used for wedding/marriage related decoration/description/wishes in Chinese culture. 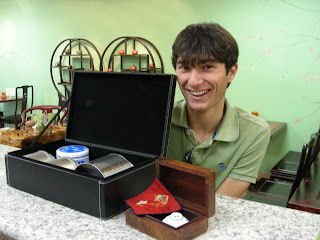 A couple members got engaged this year, therefore it is a well suited memoroir for a tea addict. Although I am not getting married any time soon, but wishful thinking will work for now. 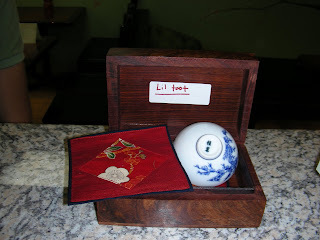 It was lovely how AJ put together the box, including a hand written letter to the crew, a post card for Jason, also a couple samples of tuo cha from Marshaln and AJ out of generosity. They are now in possession of Jason for future tasting event in the west side of the town. Many thanks to everyone who put in the time and effort to help us fulfill our passionate pursuit of tea! Tea culture in Chao Zhou, province of Guang Dong China has a long history known to be the oldest form of tea art in present days. 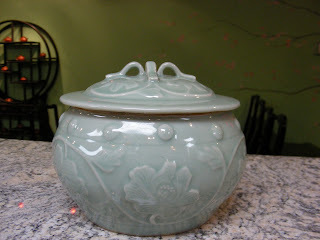 The following is one of the local tea ware of must have when making a good cup of fabulous Phoenix Dan Cong oolong. 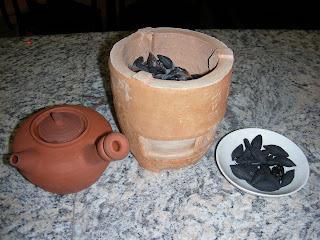 Clay pot made of local red clay for boiling water, a little portable clay stove made to retain heat within, and the last but not the least important element is Olive pit charcoal. Rustic style, coarse texture, however works wonders! The clay pot for boiling water is made extremely porous, water can sip through the wall slowly. When heated, vapor is visible from the outside. Water quality is significantly improved after boiled in this pot. Metal tea kettle makes flat and hard water. 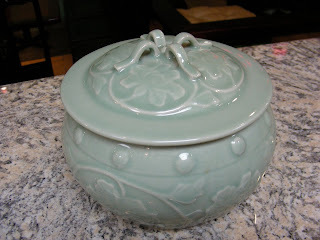 This clay pot makes sweet, round, full body, and soft water that greatly enhances the flavor of tea. Tea liquid slips down from tongue to throat smoothly like ice cream. The texture is so full, it makes you feel as the space between upper mouth and tongue has increased. 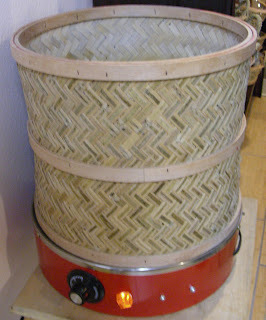 Portable stove is made with thick wall all around, a small opening at the bottom ensures airflow. 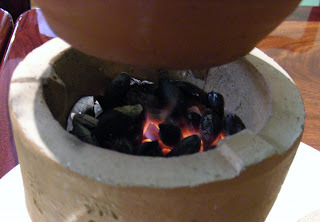 Thick clay wall serves as an insulation layer which keeps heat within the stove, heating only the bottom of clay pot. A sliding "door" can be move left or right for control of air flow, in turn controls temperature. Olive pit charcoal is a miracle, in my opinion at least. 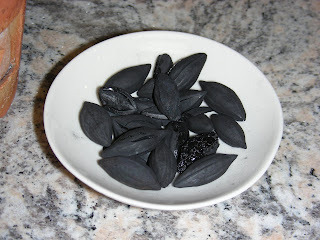 This is a local black olive varietal from Chao Zhou, unlike Italian Olive, it's low in oil, hence soot free when burning. These charcoal releases an aroma when burning, the aroma burns through the porous wall of clay pot, further enhances the water flavor, hence enhances tea flavor. Tea culture of Chao Zhou is extremely comprehensive. The region not only produces the best oolong tea, its natural resources made it possible to expand tea experience beyond agricultural. The Chao Zhou Zhu Ni clay pots, the unique floral aroma of Phoenix tea, the olive trees, the wisdom and accumulated experience through out the centuries, together give us this magnificent gift of tea culture. I feel extremely lucky having such exposure and access. My own tea experience has elevated to a level where I truly feel content with what I have to make a great cup of tea. Of course, I will not stop here. 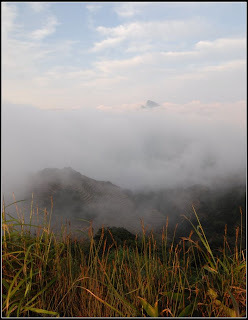 My final stop would be to retire in the mountain of Phoenix for part of the year, soak in the pure mist nourishing the soil and tea trees, drink century years old tea and watch sunrise from top of the clouds. 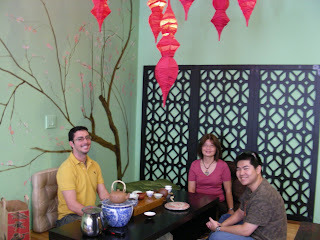 Last Saturday was the LATA (LA Tea Affair) meeting for yet another session of serial tea drinking. Members of the group including Will, Louise, Danica and myself, friend of mine Ming, friends of Danica - Angie and David from 1001 Plateau also joined the group and share their special teas. 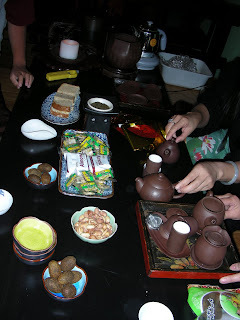 We had Moon Cakes, pumpkin seeds, Mochi, almond candies, dried plums and other traditional Chinese tea snacks while sipping tea and chatting away. Time flies when companies are great! Being Chinese, traditions as such are usually customary, however sharing with others whom embrace the cultural differences with such enthusiasm is rather touching to my heart. Toast to the Full Moon with a cup of Zhi Lan Xiang! LATA is a group of tea enthusiasts join together occasionally to share tea, build friendships, learn from each other, most importantly share our passion for these precious leaves. The organization has been found less than a year, we already had many semi-formal/informal tasting sessions at private homes of members and my tea shop. We have come together as tea fanatics and transcending to friendships. No wonder the old Chinese wisdom says "Tea brings people together". I am one of those lucky ones to live it up. 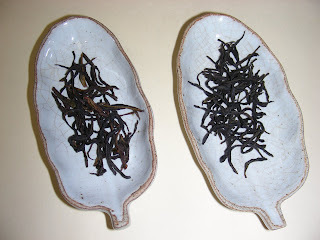 Angie and David shared their rare Da Hong Pao and Rou Gui, which both are excellent teas. And warm welcome to both of them from all of us at LATA! 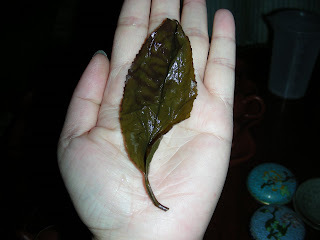 Leaves of Da Hong Pao: amazingly large leaf, very tasty and long lasting. Chao Zhou pots for Phoenix Dan Cong... These are my own collection of Chao Zhou pots, I'm particularly affectionate toward pear shape tea pots, any size, any shape. What is Phoenix Dan Cong? 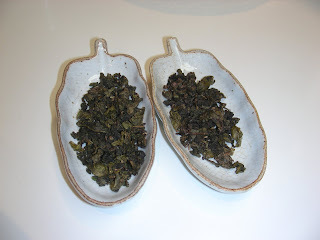 Phoenix Dan Cong is an Oolong tea, has a long history dates back to Tang dynasty. Chao Zhou Kung Fu Tea is well preserved live chronical history in tea culture. The mountain ranges of Phoenix has long been the nurturing soil of the local tea trees. There are less then 10 thousand old single bushes alive on these mountain ranges today. There were 20 thousand at the turn of the 1900, war and unstable politics were the main cause of ecology decline in the region and the entire country. Wu Dong mountain is the best among the ranges. 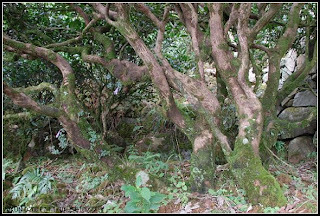 The oldest bush believe to be about 600 years old, one of the Song Zhong varietal, white leaf type. Although it's the most famous bush world wide, but it's not a tasty tea known by the locals. I have to agree. 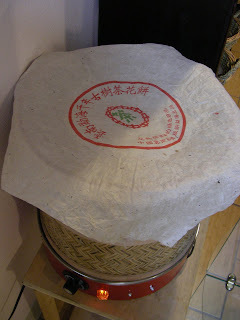 Dan Cong is the highest grade among Phoenix tea. Shui Xian being lowest, Lang Chai medium. Dan Cong is a single bush selected for its own distinct aroma and flavor, process separately from other bushes. Hence labor intensive and unique. Today's commercial grade Dan Cong are cloned using branches from the mother tree, instead of sowing from seeds which flavor can be mutated on its own. Commercial grade Dan Cong contains the exact same aroma and flavor of the mother tree, therefore can be harvested and produce large crops each season unlike the single bush method. However, old bushes are still processed on its own, one tree at a time today. Farmers are more aware of the plant cycle scientifically, hence better to preserve these old plants by letting them rest for most of the year, harvesting only in the spring. Today, I reach a new height in tea drinking experience. I had been tea drunk before, the experiences were over dose of caffeine. 2005 Lao Ban Zhang left me jittery hours after just a few grams. 12, 20 teas a day left my brain restless, but not organizationally functional. Today, I got drunk 2.5 times in 6 hours, I think. The last drunk was very similar to an alcohol drunk. My body was warm, itchy on my back, my eyes were stoned, I slurred, and I felt like walking on clouds when I got up. I had to make a quick head turn, and I saw a trail of lights from one shoulder to another. It's been 2 hours, I still feel drunk. After returning home, I just want to pass out. Jason and Mark stopped by today for tea. Ming was here as well. As a bunch of tea heads, we without doubts had a ton of tea, at some point, we don't even know how much tea we had or what we had. We all got drunk a few times. I got so drunk, I refused to drink more tea after I got home. 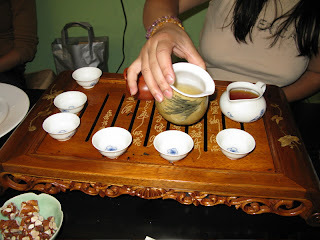 One tea that particularly hit all 4 of us hard was the Chuan Du Lao Ming Cong Dan Cong. Jason stopped drinking it after 4 cups. We were so buzzed, we all stopped drinking after the 6th infusion. I worried if I could make it home safely. My perception of depth was all off. Chuan Du Lao Ming Cong is 1 of the 10 best Single Bush trees on Wu Dong Mountain. Only a few pounds are produced each spring. I got my hands on 500g, the anticipation of its arrival left me sleepless for many nights. Finally it arrived on Friday afternoon when Will's visiting, just right before he planned to leave. We tried 1g in a gaiwan, it was good but not what we expected (highly). However I did have 2 hours of sweet after taste lingered in my mouth. It was quite nice, but not mind blowing at the time. This afternoon, I brewed 3g in Jason's Duan Ni pot. First infusion was __, I have no words to describe it. It does not taste like anything I can put a name on. Strange, not mind blowing, but interesting. I was curious to open the lid, WOW!!!!! It smells beautiful! Not nice, not fragrant, not just a regular word of flower. Just beautiful!!! The aroma is amazing, it literally smells like a real orchid, somewhere between a large white Cattlaya and a white Dandrobium. It's pure, drifty, clean, clear, lung opening, with a hint of winter honey sweetness. We kept drinking the second and third infusions, taking very small sips of tea at a time, 3 drops maybe. The flavor of the tea was magnified with each little sip. I still don't have a word for it. Honey like sweetness increased with each brew. Jason took away his cup while I was still trying to think of a word to describe it. By that time, we were all drunk and talking gibberish. I remember I said something like laying on clouds drinking cloud. Jason got up to walk off the buzz. Over all, I still don't know how to describe this tea. It left me contemplating, chasing something illusive. Maybe this is why it cost so much. The drunken effect justifies the price perhaps?! It was a fun eventful drinking afternoon. Here is a list of tea I (we) drank today, I am still drunk that I may skip a couple here and there. Where in the tea world are you? In the world of tea, where are we, where am I, what is my function in this ever evolving sphere? I found this article in Chinese, the author logically places each and every one of us in a systematical spot in the world of tea base on our knowledge of tea. I translate it and put in my 2 cents worth of thoughts. 1st layer(outer) which is made up of majority of people whom are tea drinkers/consumers. 3rd layer which is made up of tea processors, people with skills to turn a green leaf into dried commercial product. 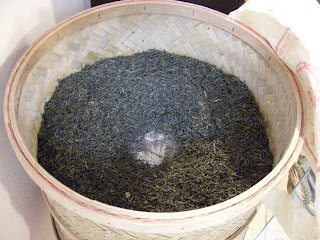 4th layer which is made up of tea farmers, people who grow, maintain, collect leaves from trees. Consumers are end users who are the least knowledgeable of tea, however their preference is the driving force of the tea business. Tea merchants posses skills to brew a good cup of tea, a translator/communicators between tea producers and consumers. This group of people know a broad spectrum of tea from every category/type/region, learn about each tea's characteristics and brewing properties. Their knowledge and opinions serve as guidelines, they direct and collect feed backs of trends. I direct my customers toward oolong. Tea merchants can be tea processors at the same time. My latest batch is a medium roasted Ali Shan high mountain tea. The whole process took 3 days at various temperatures. Taste good when hot, cold brew is exceptional! Tea processors are skilled "chefs" whom turn raw materials into tasty meals. There are endless recipes of existing flavors, and endless possibilities to create new recipes. The best chefs are those whom can improvise base on existing skills and traditional methods, able to recognize and extend strengths of a tea. However, market trend also limits possibilities to think out side of the box. Popularity and exceptional quality are usually unparalleled. Tea processors are specialist of a certain type of tea, rarely cross types. Most tea processors are whole sale tea merchants. Tea farmers are those grow and nurture plants of tea. This group specialize in a certain verietal as well due to geographic limitation. Majority of them are semi processors producing mao cha before selling to tea processors/merchants. My personal development began as a common tea drinker to tea taster, now a retail tea merchant, beginning tea processor. I expect to spend many years hovering at this level, learning, practicing, refining my skills. 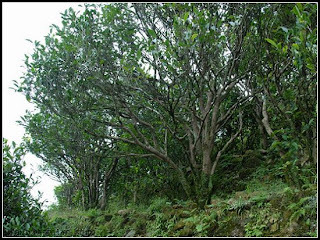 One day I hope to retire in mountain ranges of Phoenix mountain, attend to a couple of old Dan Cong bushes, pick, process, roast and drink from these bushes. I then can say I have been through all 4 layers of the tea sphere. 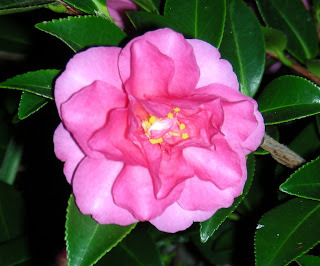 Floral note is one of the most frequently used term in tea taste description. Where does it come from? How come broccoli does not have a floral note, but a tea leaf does? Oolong tea naturally posses lovely floral aroma, especially those grown in high altitude mountain ranges. The climate provides what it takes to produce high quality tea. Cloud hovers around 800 meters above sea level, tea grown at that altitude has the best flavors. Cloud provides constant moisture and blocks direct sunlight, however ultra-violet ray can still penetrate thick cloud layers, providing light for leaves to grow at a much slower rate, chlorophyll, tannin, essential oil concentration is higher than lower altitude plants, hence fuller in flavor and body with more intense aroma. 4th topic, how to raise a clay pot? Very first step is to season a pot. 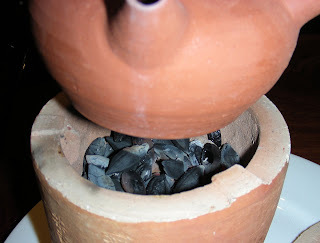 Clay pots were fired at lower temperature usually remain an earthy smell. Seasoning a pot is to rid of earthy smell. Brush new pot with clean toothbrush under water. Submerge cleaned tea pot in a large clean (oil free, odor free) cooking pot filled with purified water, bring it to boil and "cook" for 30 min, rinse hot teapot under cold water. For good quality clay pot, it should be good to start brewing tea. If clay smell persist, repeat boiling and cold water rinse a couple more times, add tea leaves to boiling water during last boil, let teapot steep in tea over night, rinse in the morning before brewing tea. Step 2, find a suitable tea for the pot. In order to find out what tea can be enhanced by a clay pot, it's best to compare flavors of the same tea with same quantity, water, temperature and timing in a gaiwan and clay pot side by side. Gaiwan brings out the true flavor of a tea, both good and the bad. By comparison, if tea brewed from a clay pot taste better than gaiwan, then it is meant to be a pair. In most cases, it takes a few hit and miss to pair up a pot. Brewing a few different teas in the same pot will not intermix flavors of the subsequent tea while it's new. Raising a pot takes time and attention. If you do worry about that, just re-season the pot again by boiling then rinsing in cold water, repeat until you can't smell any flavor. After you decide what tea to brew with a clay pot, the lengthy process of raising a clay pot will begin. 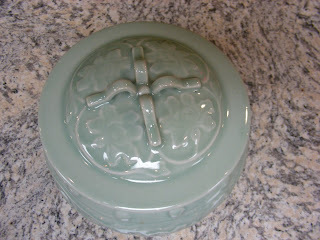 I posted a short version of how to raise a clay pot here. External raise can be done with various methods: polish with cotton cloth after pouring tea over exterior, or brush with tea then polish/dry with cotton cloth after each use, or rub with bare hand and tea then polish/dry with cotton cloth after each use. Each pour of tea is an additional layer of essential/tea substance deposit on top of each. Polishing/buffing is to evenly distribute these deposits. This step is to improve the cosmetic of a teapot, it has very little to do with the flavor of tea. To conclude it all, the purpose of raising a clay pot is to enhance the flavor, improve the exterior beauty of a pot, extend the over all tea experience and a measurement of how obsessive you are about tea. 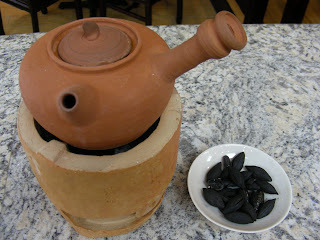 Clay pots are best for oolong and pu-erh. Green/white/yellow/herbal tea do not require the use of clay pot. Black tea is better in china ware. 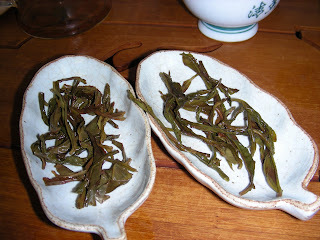 Porous pots are better with ching xiang fragrant greener type of oolong and new green pu-erh, ie duan ni or purple clay. 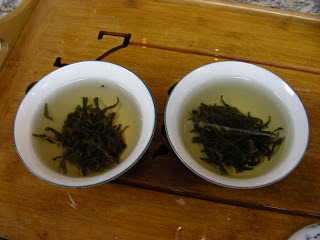 Less porous pots are better for heavier roasted oolong, older/ripe pu-erh, ie zhu ni, xiao hong ni or chao zhou zhu ni. This is only a rough guideline. There are exceptions to rules, and there are surprises to exceptions. Experiment every possibility with every imagination. 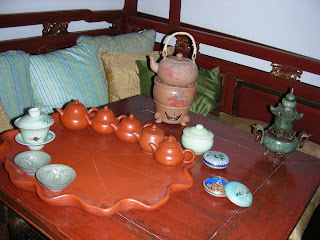 3rd topic: how tea impact the clay hence improves tea itself - why raise a clay teapot? Now that we have an idea what clay can do to tea, what can tea do to clay? Dissoluble substance of a leaf as we can observe is not colorless. Tea stain is dried such dissoluble substance. We can smell aroma of such substance dissolved in water, we can taste the sweetness/bitterness/astringency of such substance dissolved in water. Fragrance is from distinctive essential oil of a plant. Lavender oil, rose oil or tea oil are all essential oils of its own species. When dissoluble substance and oil are released from a leaf into water inside a clay pot, sip through tiny air hole among clay, when dried, the substance stays in the pores (storage cabinets). More usage of the tea pot the more deposits will be stored away. Polishing a pot is to evenly distribute these essential oil, hence the shine on the exterior. This is cosmetic enhancement of the clay pot appearance. It's commonly known to use one pot for each specific type of tea, similar in flavor and roasting method. The logistic is to accumulate similar substance in "storage", when making tea, these deposit will be redissolved again some what, hence enhance the tea flavor and aroma. Kinda like cooking a chicken with chicken broth. It's not a myth that a well used clay pot can make fragrant tea with only water. Ceramic and glass wares are not porous materials, therefore can not store away these flavorful substance, neither can they neutralize or react chemically with tea, therefore they can not enhance nor diminish tea flavor, however reflect true flavors. These 3 articles briefly explains why the need or desire to raise a clay pot. The next article will talk about the techniques in raising a pot. 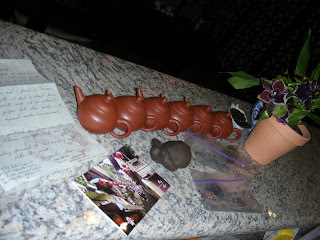 2nd topic: how does a clay teapot impact tea? Clay is made up of minerals, it can neutralize chemicals dissolved in water and tea. Wonder why natural spring water taste great and crystal clear? 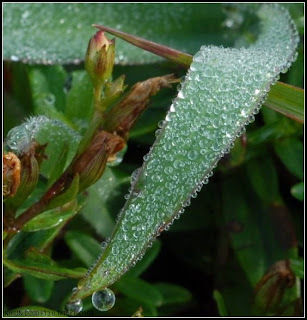 Evaporated water is pure water, however on the way up to the sky and coming back down to earth as rain or snow, dirty dust and chemical vapor polluting our air attache itself to tiny water drops. Rain become solvent of these unwanted substance drips back down to earth, runs through miles of rocks in river beds and streams, naturally filtered by these rich mineral deposited stones and rocks. A clay pot is similar to a rocky river bed, pores allow tiny air hole to increase oxidation, porous clay teapot can oxidize and neutralize dissolved chemicals/minerals in water/tea, hence improve taste of liquid in pot. However by doing so, it may also diminish flavor of tea depending on dissolved substance of a particular type of tea leaves. That's the reason why some tea taste better with certain clay type and some don't. The same tea pot may not be good for every tea. Everything revolving tea is not absolute due to element variations, so much like life, therefore our endeavor of preparing a cup of good tea is never ending. It's a perpetual pursue of experiments.